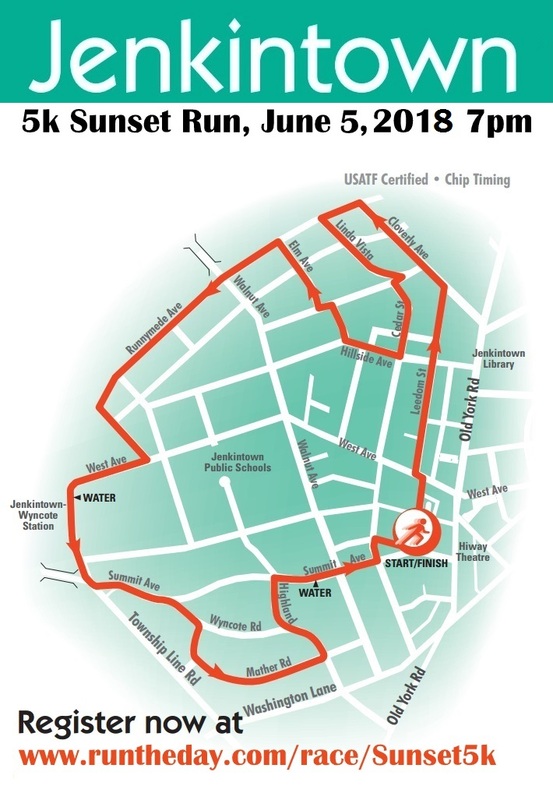 Welcome to Jenkintown’s 28th Annual Sunset 5K Run. Enjoy our beautiful neighborhoods, and celebrate afterwards on our town square. Are you ready to run the Summit? This challenging tree lined 5k course winds it’s way through the borough of Jenkintown without crossing Old York Rd. One of the largest evening 5K runs around. Come on out and join us! Live Music, and new for 2018 women’s sized tee-shirts guaranteed in your size if you order online by May 1. Kids Dash is for ages 6 and under, and no registration is required. All children will receive a prize. Open Team Registration: Teams of 4 are encourage to participate, but you can have more on your team. If you have over 8 team members please contact the race director for instructions. The run will be held, rain or shine. If you have an old pair of sneakers bring them with you and we will recycle them for you. We have partnered with Jenkintown Running Co. to recycle all donated sneakers. The race starts and ends on Leedom St by the Town Square. The Kids Dash starts at 6:45, Runners start at 7:00, and the start for walkers follows. We are doing corral starts this year. The corrals will be as follow: Under 7 minutes, 7-9minutes, 9-11minutes, and Over 11 minutes. There are no refunds given after 6/1/17. No exceptions to this rule. All participants will receive a commemorative T-shirt while supplies last! For those who sign up online by 5/29, you may pick up your race packet at Jenkintown Running Co, 416 Old York Rd, during business hours between June 1- June 4. For those who sign up online after 5/29: On June 6th, race day, you may pick up your packet at our pre-registration check-in table starting at 5:00pm.